Saving Thunder the Great: a true story of a gerbil’s rescue from the Fort McMurray wildfire, written by Leanne Shirtliffe is a story children will enjoy reading. It was May 1, 2016, when a fire started outside the northern city of Fort McMurray in Alberta, Canada. Jackson was visiting his grandparents in Newfoundland, the farthest eastern province of Canada, and had left his pet gerbil – Thunder the Great – in the care of his mother in Fort McMurray. His mother, Julie, was a young woman working nightshifts, trying to support herself and her son. On the afternoon of May 3 Julie was wakened by a friend urgently telling her they had to get out of there, the wildfire was spreading so that all 88,000 residents of Fort McMurray had to be evacuated immediately. The fire was moving so quickly she had time only to throw some clothes into a suitcase, grab the gerbil in his cage, and head her car – low on gas – out of the city. It was a terrifying experience. Along the way Julie stopped to pick up a few people who were walking in the choking smoke and let them out where they needed to go. Julie is the person who took a photo of a woman, Karley, riding her horse and leading her two others to get them out safely. That photo went “viral.” Georgia Graham‘s illustrations makes the reader feel the urgency. The Fort McMurray wildfires were very dangerous and destructive. Author Leanne Shirtliffe, talked with Julie several times to get her personal story of the events, and through Saving Thunder the Great: the true story of a gerbil’s rescue from the Fort McMurray wildfire, her story is told on a level suitable for children to read while not ignoring the real-life drama. Although the beautiful illustrations by Georgia Graham show how close the fire was to the thousands of people escaping to save their lives, they do not make this book too scary for young readers. Her work is impressive and realistic. You can find Saving Thunder the Great: the true story of a gerbil’s rescue from the Fort McMurray wildfire by Leanne Shirtliffe on my BUY THE BOOK page. I also post my reviews on Goodreads, and when available on Amazon.com, Amazon.ca, and Chapters.Indigo. I was delighted to be gifted a copy of The Story of Gar by Syr Ruus. Having read both of her first two novels – Lovesongs of Emmanuel Taggart and Devil’s Hump – which I have also reviewed here, I was eager to find out what marvellous tale the author had written this time. I was not disappointed. 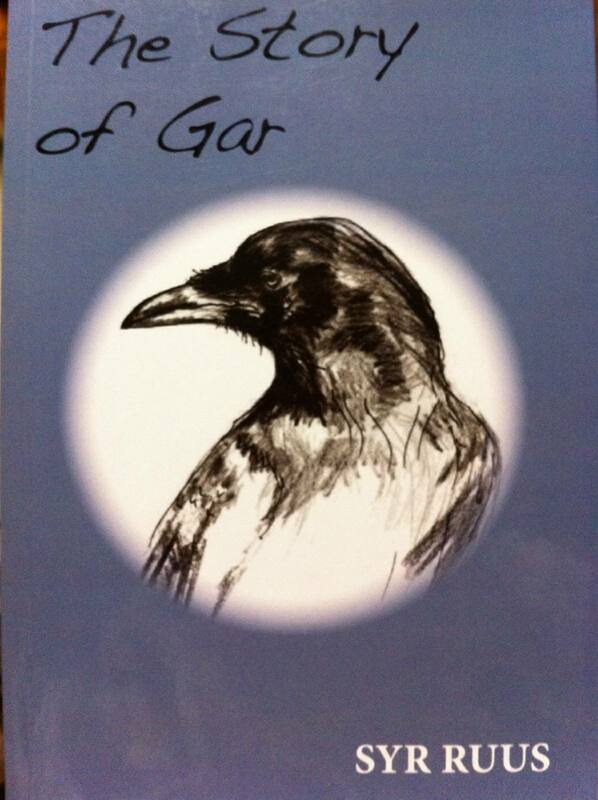 The Story of Gar is about a young mother looking for a new home for herself and her three small children, a man who is alone and likes it that way, a family of crows also uprooted from their home. We are given the interesting view of life seen mostly from the perspective of one young crow in particular. At first notion it may seem a curious plot, however, you really should read this book! Syr Ruus has woven a story that pulls the reader in, holds one’s attention, and thrills with her storytelling. This book is really about relationships and interactions – people with people, people with nature. The young family is needing a new life, and the man who helps them finds his life changing – for the better – because of them. His gift to them brings a whole new dimension to everyone’s life. The Story of Gar is a novel that a young person would enjoy. There are a couple of tastefully handled places more for mature readers, small sections that can easily be skipped over and not ruin the story should a parent/guardian prefer the younger reader not read them. A portion of this novel was awarded the Joyce Barkhouse Award by the Writers’ Federation of Nova Scotia. You can find The Story of Gar listed on my BUY THE BOOK! page. 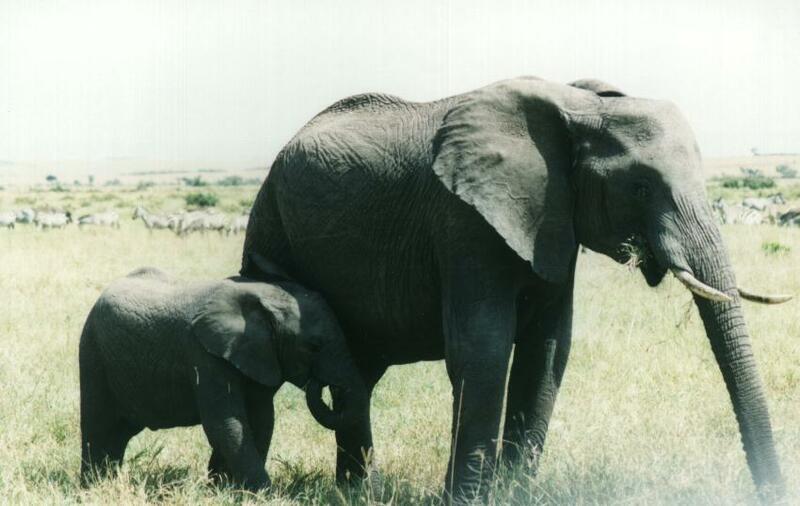 Elephants are magnificent, intelligent, amazing animals. For a very long time I have thought I would love to have my own elephant, but alas! the darling creature would eat us into poverty, I’m afraid. Yesterday I came across this YouTube video that I know will help you see more of how wonderful and intelligent they really are. Enjoy. After watching this I got thinking about the parallel of family and fellowships and writing. If we are fortunate, we can find ourselves surrounded by those who care about us, who love us and watch out for us, encouraging us when we need it. And if we are very fortunate, some of those will be of “like-mind”, enjoying and participating in the same things that interest us. That, for me now, is writing. If you are a writer and have friends and acquaintances who also are writers, who understand your highs and lows in the process, who are willing to stand by you when you get mired in life stuff or writing woes of anxiety or the agony of writer’s block, then you are truly blessed. If you have someone who is stalwart in seeing you get out of that hard place, then you .. my friend .. have a rich and beautiful gift. Appreciate it. What does this video speak to you? Does it parallel anything in your life? He turned and looked at me hesitantly, if not a little surprised. Satisfied with my explanation, he immediately began looking around, “What will I catch it with?” Grabbing a small towel he climbed onto the chair that was conveniently there, then reaching up he neatly and quickly covered the little brown bat with the towel. Carefully wrapping it securely, he stepped down and picked up a plastic grocery bag. After he gently placed the towel into the bag we tied off the top to be sure its contents stayed inside during its relocation journey. Then my cab pulled up. “Do you hear that?” I asked the driver. He looked over, “What?” His radio music was quite loud. “Ooookaaaaaaaaayyyy.” The look on his face was priceless. “Does that bother you? Is it a problem?” I asked him. “Oh, no, … it’s not a problem.” He kept glancing over at the bag. The driver agreed it seemed fair. Then the conversation began, mostly about bats. He told me that one of the cab drivers got into her vehicle one morning and there was a bat in it. He said, “As soon as she knew the bat was in her cab – she wasn’t!” We laughed. The drive was less than twenty minutes but it didn’t take long for the bat to find its way out of the towel. He crawled around in the bag, clicking, which I believe was his sonar .. trying to find distance so that he knew it was an opening to freedom. I checked the bag to be sure I had not mistakenly been given one with a hole in it. Even though I like little brown bats I don’t think I would appreciate one crawling on me. After the cab left my yard I took the bat-in-a-bag up onto a little hill beside my house. Setting the bag down beside the trees I untied the top, stepped back and waited. It took maybe twenty seconds for the bat to find the way out. Soon his little head popped up over the edge and with a flurry of fast little bat wings … zip! zoom! … he was gone, silently flying away between the trees. Would you believe … just as I finished writing the above my husband called to me, “There’s a bat in the house!” He had seen one flying around but lost sight of it, so we went looking. 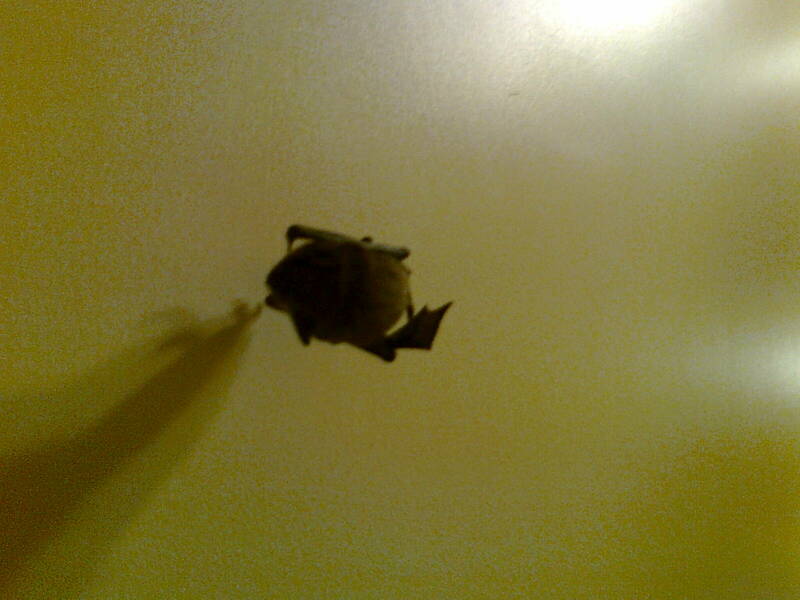 Sure enough, from the living-room he saw a little brown bat hanging upside down from the ceiling in the adjoining room. Hilarious! I grabbed a towel … and released the little guy into our yard. Again. Could it have been the same one? What weird and wonderful thing have you done lately?